According to the original alpha survey list for Bermondsey, up against the river wall near East Stairs, there was some sugar refinery waste. I don’t think the present FROG has ever seen this, and the area is often covered with sand anyway. 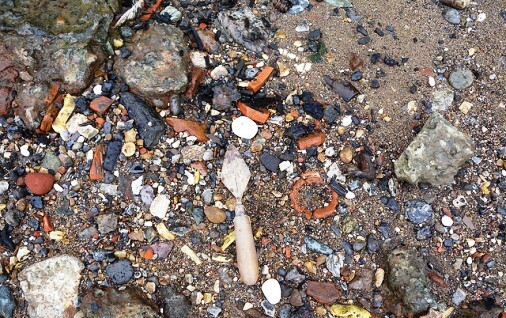 In 2009, a small deposit was also observed further downstream at Rotherhithe (see image above). However, I thought I should find out more about what it would look like, in case we needed to recognise it someday. 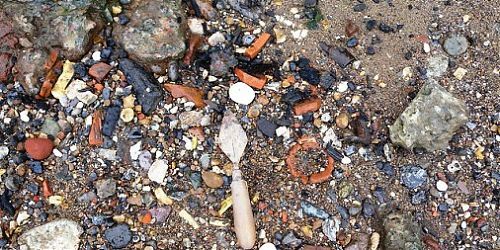 I got a good start during Totally Thames in September, when I went on a walk at Bankside led by Dr Fiona Haughey, who talked about foreshore finds. 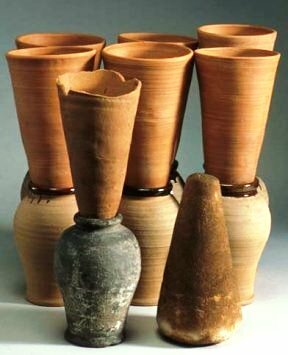 She looked at what people picked up, and one thing someone found was a piece of pottery, unremarkable reddish-brown unglazed stuff, which could almost have been a bit of tile, but with a thin layer of whitish slip on the inside. And this was my first piece of sugar refinery ware. There are two really good online sites dealing with sugar refining in 18th and 19th cent, and one of these is by Bryan Mawer. It has pictures of everything to do with sugar refining, as well as documents about its history and the names of known sugar bakers and other workers, mostly in the UK. In particular, there is a clear diagram of a sugar mould and collecting jar, giving the dimensions and explaining their particular features. The mould is a long cone shape, in which the sugar can solidify into the well-known sugar cone shape. It has thin walls, with a smoothed or slipped interior, tapering to a hole at the base 1 inch in diameter. The point of the mould sits in the collecting jar, which has a heavy rolled rim to take the weight of the mould and the sugar in it, and a heavy base also. The collecting jar is for the liquid molasses or syrup which drains off as the sugar crystallises. All of this should make refinery waste fairly distinctive. 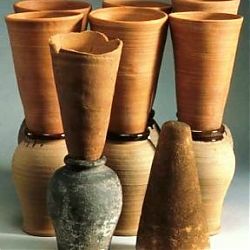 The image on the right shows one of the fragmentary sugar moulds from Goldsmith Street, Exeter, sitting on an excavated syrup pot from a different site, together with modern reconstructions of their form when complete and a modern sugar loaf of the type which would have been made in a cone. The other interesting site is the website of the church of St Georges-in-the-East, in Whitechapel. It has a remarkable history of the whole area of the parish, which was the centre of sugar refining from the mid 18th century until its decline in the later 19th century. The industry seems to have been dominated by Germans, at least at first. It was quite dangerous (what industry wasn’t in those days! ), and workers often slept on site to be there in case of fires. The raw sugar passed down chutes into cast iron tanks called “blow-ups”, with mechanical paddles and steam pipes to heat the water. The “liquor” then filtered through twilled cotton and passed through so-called “animal charcoal” – actually bullocks blood – to remove the colour. Then it was boiled and processed. It was hard, hot work, but well paid, and not all immigrants stayed, some returning after a time to Germany. The industry declined in the later 19th century, partly to do with the introduction of beet sugar, but also competition from Scotland, and economic changes. Another known site for sugar refining was Thames Street, also north of the river. I could find no mention of sugar refining in Southwark, so I am not sure why there would have been sugar refinery waste on the Bermondsey foreshore. But I’m a bit better prepared for finding it if there is any, and I hope those on the other side of the water will keep a look out too.